Beautiful bathroom shower ideas can instantly transform the look of a space. This beautiful updated bathroom previously had a traditional bathtub/shower combo with fabric curtain. 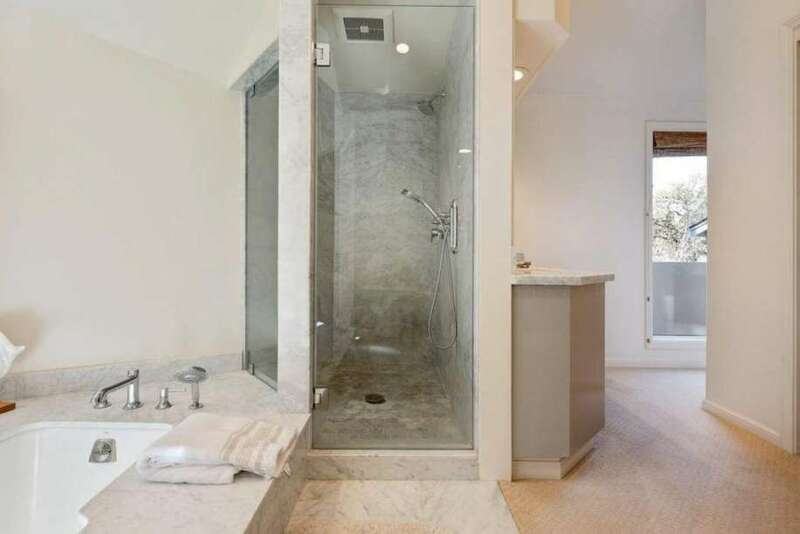 As you can see, adding a gorgeous walk in shower with glass shower doors completely updates the style of the bathroom. 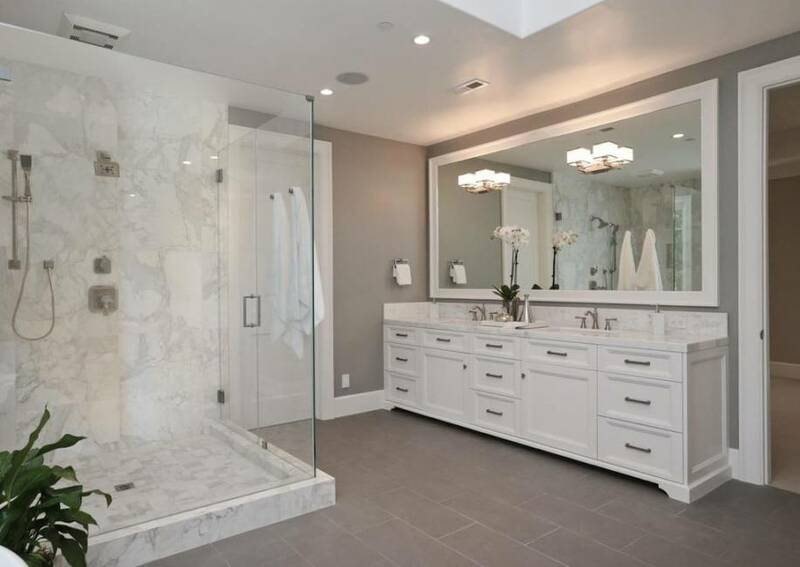 Rather than just keeping the tub and adding shower doors, the homeowner decided to replace it with a standing shower and separate luxurious freestanding tub. Walk in shower enclosures like this allow you to showcase the decorative marble tile work and brushed nickel hardware, while creating a much larger and more open space. If you want to mimic this look but on a smaller budget, you could simply add shower doors to an existing tub/shower combo and add decorative marble tile on the walls. Great bathroom shower ideas can really transform an otherwise ordinary space. Amazed by this gorgeous marble walk in shower with clear glass enclosure and brushed nickel hardware because it is the perfect mix of contemporary trends and classic decor. This is such a great way to open up the space, and make the bathroom seem much larger than it is. Corner shower stalls are also such a great way to not only gain a much larger shower space without taking up the majority of your bathroom, but are also perfect to occupy that extra often unusable space in the corner. Even better, these bathroom shower ideas can also be fitted with sauna kits to create an even more luxurious retreat. Really enjoy bathroom shower ideas that transform the design from ordinary to an extraordinary luxury retreat in your own home. Adding beautiful shower enclosures with decorative tile and stone completely change the look of a space. The unique design of this shower makes it a decorative element that accentuates the bright open concept bathroom, rather than distract from it. 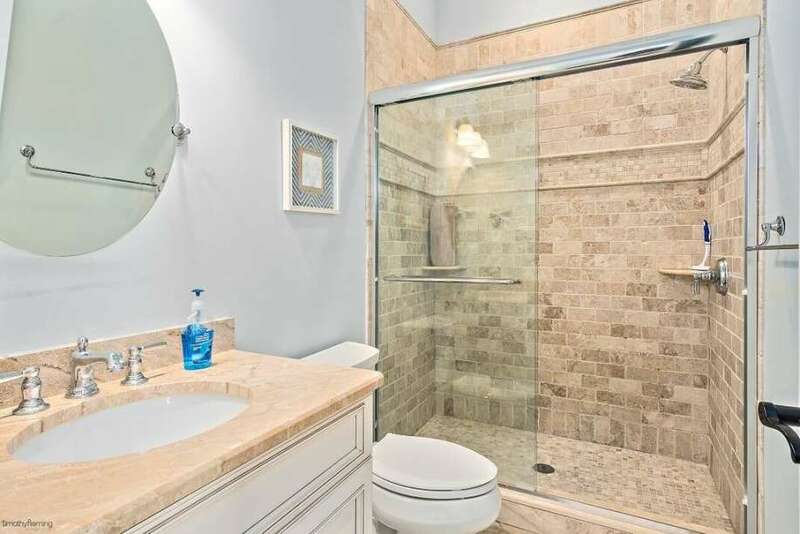 Not only do the glass shower doors open the space and make the bathroom seem larger, but they allow you to showcase the beautiful tile detailing and contemporary metal hardware as opposed to covering it with a curtain or frosted material. Beautiful marble tilework in the walk-in shower ties and jumbo Jacuzzi tub accentuated by a large picture window. Because a brighter space can make small bathrooms appear larger and more open, the color scheme you opt for will be essential to your design. For example, painting the ceiling white will cause the room to look taller and less cramped. Similarly, painting the walls or installing bathroom tiles with a pale yellow or soft ivory will reflect both natural and artificial light to brighten the space and give the illusion of an open floor plan. Other bathroom paint colors that can help to open up the space include pastel blues, light greens, and softer shades of grey. Paint is not the only thing that can help to brighten a small space. If you are looking for bathroom design ideas, look no further than this beautiful remodel. The dusty blue wall paint combined with the soft travertine tile work, create a fabulous neutral foundation to any decorative accents you may want to add. With these light and airy tones you would never know that this is actually a tiny space. The homeowner took concepts found in the best small bathroom designs and elevated them to a new level with stylish touches. Most designers recommend using a neutral color palette with a lot of white and beige hues in order to make a tiny floorplan seem larger, rather than dark and enclosed. Great bathroom renovations are an awesome way to update the look and value of your home. Whether you are revamping an existing space or adding an additional bathroom, potential buyers look for contemporary style, quality finishes, and a neutral palette that can easily accommodate any decor scheme. 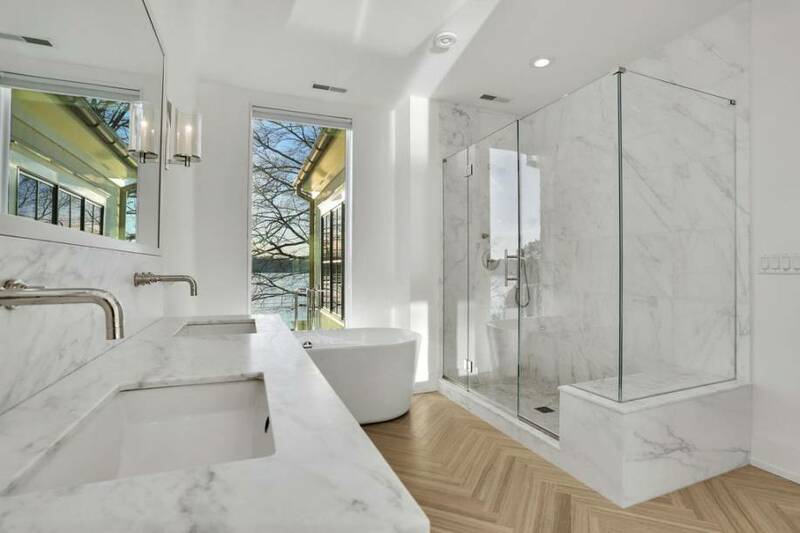 Master bathroom designs like this one — complete with free standing soaking tubs, large glass showers and luxe marble tile detailing — sell homes. If you want to update your space but do not have a large budget, begin with bathroom shower ideas. The shower is one of the largest features in the room and can be the first to reveal the age of your home.